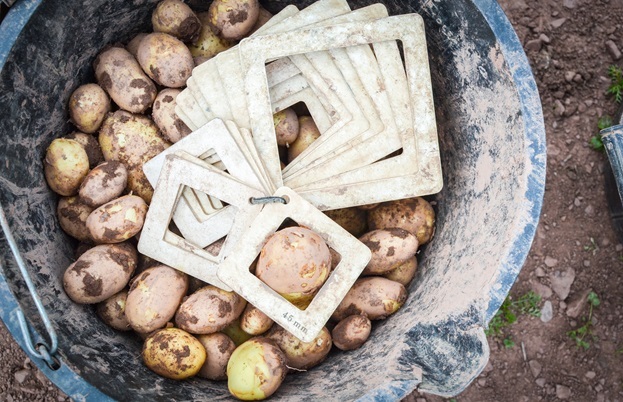 'Tis the season for early potatoes: sweet, small, succulent potatoes that are sown and harvested within just a few weeks. A fantastic variety to try is the Pembrokeshire Early. 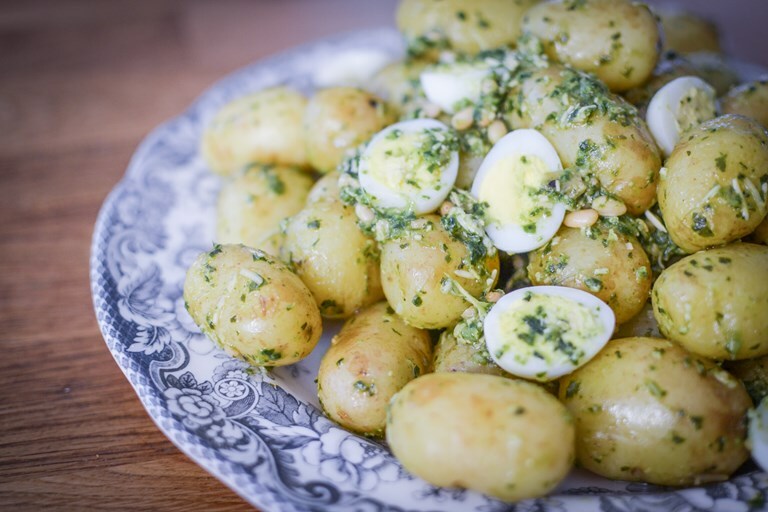 Urvashi shares her recipe for these delicious potatoes, paired with a fresh nasturtium pesto and delicate quail's eggs, and recounts her visit to a farm on the coast of the Irish Sea to see how they and grown and harvested. What makes this potato special is its Protected Geographical Indication status. What does that actually mean? Well, the EU brought in legislation in 1993 which protects food names based on a traditional recipe or geographical location. The scheme aims to protect products against being imitated in the EU. Why is this important? Think about how many cheeses there are called ‘cheddar’ but how many are actually made in the geographical location they should be? Champagne for example is only made in Champagne. It cannot be called Champagne if it is not. 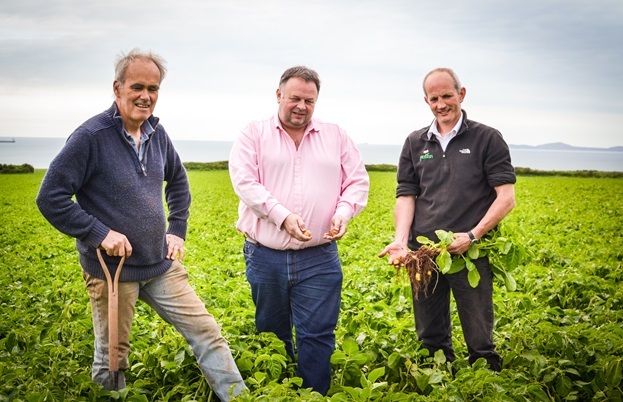 The French have fought to protect it and the area where it’s made and this is what the Food and Drink Wales Industry Board are seeking to do with these potatoes and a variety of other Welsh food products. The Pembrokeshire Early is a beautiful potato. Earthy and sweet in flavour with very specific characteristics. They are just 15-70mm in size and almost perfectly round. The skin is so soft that no peeling is required – you can just push it away with your thumb. The farm I visited was along the coast near St Bride’s Bay in Haverfordwest. Farmer Will Richards showed me how to dig them out of the ground so none would be damaged by the fork. His potatoes are harvested by machine however as there are rows upon rows of them in his field looking out to the Irish Sea. He’s been growing them for years and years and is still passionate about their flavour and importance in the Welsh food industry. 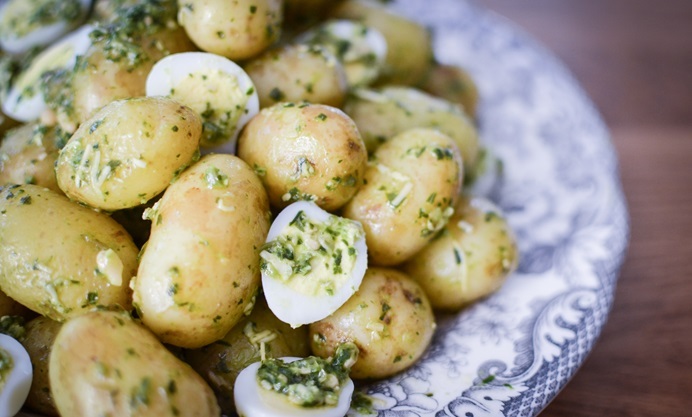 He suggested simply steaming them and eating them with lots of Welsh butter, Anglesey sea salt and home grown chives. As these are in season the same time as my allotment nasturtiums, I enjoyed them with nasturtium pesto with quail’s eggs. If you can’t find nasturtiums you can use basil or coriander.